Every generation of Christians face challenges in ’running the race of faith’. Living for Christ in the 21st Century is no exception. The Apostle Paul warned that ’the time will come when men will not put up with sound doctrine. Instead, to suit their own desires, they will gather around them a great number of teachers to say what their itching ears want to hear’. 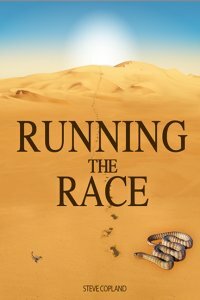 ’Running the Race’ challenges the extremes, throws light on the shadows, and illuminates the path which Christ has set before those who have trusted Him with their lives. crisp, clear, and challenging guide for competitors in the greatest race of them all!" "The first time I read it through I had to stop at the first chapter. I used what I read in presenting the gospel. Now I get to use the other chapters while I disciple the one who got saved!" "Steve Copland’s Running the Race is a must read for all who seek assurance of their salvation. He pulls no punches in describing the cost of discipleship. A wonderful guide in first steps for the new believer and an excellent review of fundamental principles for the mature Christian."